The world may be going digital but we are not yet living in a paperless world. From school projects to e-tickets to income-tax returns, we still have to rely on physical documents. You can always visit a cyber cafe to get a print, but at the risk of jeopardising your digital security. So if you are willing to spend Rs 5 on a monochrome and Rs 10 on a colour print in a cyber cafe, why not invest in an all-in-one printer that can do the same job for as low as Rs 1.5 per page? If an original ink cartridge is used, a printer should work flawlessly for three years or more. Original cartridges help in producing quality prints while eliminating chances of the printer being damaged. Cheap replacements can cause ink leakage or head damage, the repair cost of which can be burn a hole in your pocket. While not in use, printers should be covered and protected from dust. Left idle for long periods, there is every likelihood the ink will dry up. You can avoid this by not exposing the cartridge to extreme heat or cold. Also, take out a colour print every 7-10 days. But will any printer do? "While buying a printer for home, do keep in mind the volume or the number of pages you need to print," advises Nitin Hiranandani of HP. "Also see if you need the new connectivity options, such as wireless printing." But buying a printer is a long-term commitment. This is one device that requires care - regular cartridge replacements and so on. Here we suggest three feature-rich colour multi-functional printers that cost under Rs 10,000, and also tell you the best ways to maintain home printers. This compact printer from Epson has the paper input tray at the back. The front has an adjustable tilted panel with the coloured display and physical control keys that makes operating this printer really easy. Prints obtained on the draft mode look a bit washed out. Hence, we suggest you use it in the high-quality mode. Copy and scanning feature can be directly operated from the display panel itself. By navigating through the controls, we were able to select the number of copies as well as select between B&W and colour prints. Interestingly, the prints obtained from this printer are smudge- and water-proof. So even if by mistake someone spills water on your coloured print, just let it dry and the print will be intact. There is a memory card slot at the front. This is a basic, low-cost printer. SPECS: Inkjet all-in-one; Print, copy, scan; 30ppm monochrome, 15 ppm colour; 100 pages input tray. 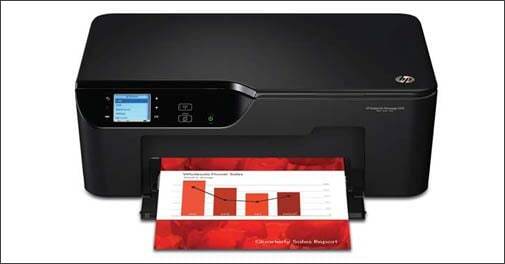 The HP 3525 is the best ink-advantage printer from HP under Rs 10,000. The straight line design makes it look good and gel perfectly in almost any environment. Configuring and operating this printer is child's play. While we were able to print, scan and copy from our PC, the job was perfectly done using the keys and the display on the printer as well. We had to double check the prints on the normal mode as it felt far superior than the best quality prints without compromising on the speed. For sharp prints, the Best mode is actually the best. SPECS: Inkjet All-in-One; Print, copy, scan; 22 ppm colour, 23 ppm monochrome; 80 pages input tray; 5 kg; Wi-Fi. Successor to the Pixma E500, the E600 has gained some weight and looks bigger. 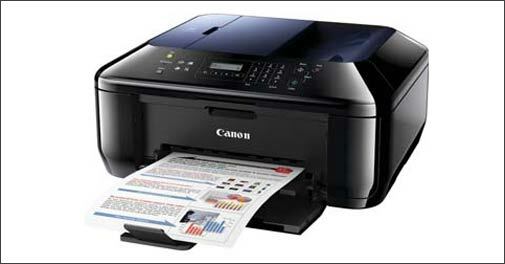 Capable of quality prints, there are some additional features like auto document feeder and fax. Configuring the printer was time consuming as it took close to 20 minutes to install the software. There are a number of controls accompanying a small display and this is irritating. Printing was good on high as well as standard mode, while scanning was about average. While there is nothing wrong with the E600, we recommend you go for the E500 if you don't need the fax. The latter is smaller and cheaper too. SPECS: Inkjet All-in-One; Print, copy, scan; Fax; 8.5 Kg. If your cartridge is running out of ink, you can either replace it with a new one or go for a refill. If you do a Google search on "printer cartridges", you will come across numerous names like re-feel.in, cartridgeworld.in, etc, that are proper retail channels servicing empty ink cartridges. But the question is whether you should go in for a cartridge refill or not. "Printer companies lose revenue and their bottom line is hit if cartridges are refilled or remanufactured. In inkjet printers, the cartridge does not even touch the paper and just throws ink on to the paper. The only point of contact between a printer and a cartridge is through the electronic circuits. Nothing can go wrong in a printer if the cartridge ink is of good quality and filled properly." Buying a new cartridge is an expensive affair and can cost between Rs 449 and Rs 1,000, depending on the printer you have. That's the reason why refill market scores with consumers-the cost of a refill is just Rs 100 per cartridge. There is no denying the fact that original ink cartridges offer better quality prints. A reason why companies discourage the use of refill is because their ink uses complex chemical formulations developed after research. For instance, in ink-advantage printers, the ink doesn't accumulate at the nozzle, preventing blots. Refilling the cartridge always involves a risk of leakage that can spoil the printer. "Leakages take place when a cartridge is refilled through drill and fill method and incorrect / universal inks are used. This is what takes place in the unorganised sector. We use a scientific recharging process and our cartridges perform as good as new ones," says Tejas Zaveri, Head - Marketing & Franchise Development, Cartridge World.